You may have seen that works are underway on three buildings near the junction of Peckham High Street and Peckham Hill Street. These buildings are Phase 1 of the Peckham Townscape Heritage Initiative. We prepared the Peckham THI update summer 2018 for handing out at the Peckham Rye Park Fete on Saturday 1st September. It has information about Phase 1 plus news on other aspects of the THI. Available from September 2018, the Peckham History Trail is another of the Peckham Townscape Heritage Initiative community projects. It’s been designed to be enjoyed as an adventure by families with primary-school aged children. Peckham has a long history and this Trail reveals clues to its past. Enjoy! Particular thanks to the families at the Tomas Carlton Centre who contributed early ideas to the project, and to Julie Garton who researched and wrote it. The PECKHAM HERITAGE REGENERATION PARTNERSHIP is part of the PECKHAM TOWNSCAPE HERITAGE INITIATIVE and has been running for two years. • Identify opportunities to work collectively to promote awareness and take action to enhance the Rye Lane Peckham Conservation Area and Peckham town centre. • Hosted an event on Caring for Traditional Buildings and funded the development of a Heritage Learning Resource for primary schools. THERE ARE MANY IDEAS ABOUT HOW TO TAKE THE WORK OF THE PARTNERSHIP FORWARD. NEW MEMBERS ARE SOUGHT TO HELP DO THIS. We currently have 5 places available for membership/co-option. These can be individual residents as well as local businesses, organisations & groups. • helping out with communications – website, Tweets etc. Derek Kinrade, local historian has provided two more fascinating sketches about buildings in the Rye Lane Conservation Area – The Greyhound, 119 Peckham High Street and 117-125 Rye Lane. Check them out in the Heritage Information section. This public house is identified as part of a heritage cluster on the Peckham Townscape Heritage Initiative map of town centre priority projects. Happily it is one property that, without prompting, has been freshened up by its owner so it’s an exemplar of what is possible in a generally run down, tired high street. The present building dates only from the 1880s, and apart from television screens is a specimen of an authentic Victorian hostelry, with old racing scenes on its walls, sculptures of greyhounds everywhere, and, as far as I could judge, a clientele intensely interested in the running of their current equivalents. More interesting, however, is its predecessor, for it dates back to at least the 17th century, and was situated at what was then the very hub of the village. I was already aware of a playbill from 1807 which located Peckham Theatre as “Opposite the Greyhound, Peckham” (shown above), but was delighted to find among Bill Marshall’s papers at Southwark’s Local History Library a reference to rubbings of Greyhound trade tokens dating from 1660. Further enquiry brought out a copy of these rubbings (shown below), inscribed on the obverse “WILL ERBERYAT THE”, with a greyhound running, and on the reverse “GRAYHOUND IN PECKHAM”, with the initials W.M.E. Now this is interesting in itself, but more so in that greyhound racing is said to have originated only in the 19th century. Coursing preceded this, first described by Arrian in c.180AD, and codified in Britain during the reign of Elizabeth I. It appears, however, to have been essentially an aristocratic activity, until the first club meeting, at Swaffham, Norfolk, in 1776. Here from Peckham, perhaps, is something intriguing for canine historians. Photo of 117-125 when C&A occupied the ground floor (from Southwark Local History Library and Archive). There is a certain mystery about the building at this address. In the Dec 2014 issue of The Peckham Weekly, (p.8) Benny O’Looney proclaimed it as part of the art deco development of 1935 surrounding Peckham Rye Station, designed by Southern Railway Architects under the direction of James Robb Scott (1882-1965). And I find no reason to doubt this attribution, there being obvious features in common across the group of buildings. I agree too that it is “the most prominent member” of the group, a fine building worthy of a great architect. This is supported by the shape of the building, in place opposite the station, complete with chamfered corners on the front, west elevation, shown on the OS map of 1937. But if you then go to the unimpeachable Historic Area Assessment of Central Peckham prepared by Joanna Smith and Johanna Roethe of English Heritage you will find it described as part of a piecemeal rebuilding of individual premises on Rye Lane around 1949, “occupied from the outset by a second branch of C&A (Modes)” (p.43, my italics). This is, I think, somewhat qualified on page 108, the report having previously conceded that its art deco treatment “seems rather old fashioned for its date”. This suggests that the building was otherwise occupied between 1935 and 1949. Turning therefore to the Post Office street directories, I found that prior to 1935 numbers 117-125 were part of Holdron’s department store, whereas in 1936, presumably in the new building, business was transacted by Henry’s Stores, drapers, and in 1937 to 1939 by Kingsword & Marle Ltd, furniture manufacturers. The mysterious thing is that through the war years and beyond to 1950, despite the annual directories continuing to be published, there is no listing for numbers 117-125. Perhaps there was a security reason for not advertising what went on in that part of Rye Lane? It is beyond most memories, but it would be interesting if anyone can throw light on this period. Perhaps it doesn’t matter? Most elderly people remember the building as a typical C&A store, and this is the photographic evidence: a huge property with an impressive frontage, well-maintained. There is no argument about its destiny: its closure in January 1987, an early casualty which would see the entire withdrawal of the company from the United Kingdom by 2001 (though still flourishing elsewhere). In 1998, the South London Temple, a Pentecostal church, moved into the upper floors, and independent retail outlets now trade from the ground floor. The huge building remains structurally intact, but inferior graffiti despoils the side and back walls, and the paint is peeling from the beautiful frontage, its fine architectural features obscured by over-painting, gaudy panels and crude shop fronts. “Tacky” is how one website has described it. However it is remediable and this building is eligible to receive funding towards its restoration through the Peckham Townscape Heritage Initiative. Whether Network Rail, its current owners, will seize this opportunity, remains to be seen. ‘Conservation Areas’ are 50 years old. The first one was designated in 1967 and there are now over 10,000 in England. Peckham town centre is within the Rye Lane Peckham Conservation Area, and there are three more Conservation Areas adjacent. What are Conservation Areas are? How do they protect our historic built environments? What can be done to boost the impact of Conservation Areas? Tuesday 23rd January 2018 at All Saints Church Hall, Blenheim Grove, Peckham, SE15 4QS. 7-9pm (6.30pm for refreshments). The full programme for this all day free event which was held on 30 September 2017. This event had talks and demonstrations on topics relating to traditional brick-built buildings, as well as a number of information stalls. It was relevant for anyone interested in Georgian, Victorian and Edwardian buildings, also a great opportunity to find out about careers and training in the fields of Construction, Architecture and Conservation. The series of talks, which attendees could book in advance, were popular, and we provided free childcare for those who needed it. The websites of both the Peckham Society and Peckham Vision are treasure troves of information about Peckham’s built heritage. For example, Peckham Society History pages contain research and articles on themes such as Peckham in 1878, Peckham Rye park and Peckham theatres. Peckham Vision’s website also has also has an Historic Peckham area which has a collection of photos and film clips of the town centre. You can also access there pdfs of the information boards prepared by the Peckham Society and Peckham Vision when they were lobbying for the Rye Lane Peckham Conservation Area. In addition there is a section showing the images created by Peckham Vision to highlight the Art Deco quarter which includes a number of landmark buildings within central Rye Lane in Peckham town centre. Both organisations have given their permission for their websites to be referenced in these pages. For several decades the Peckham Society played an important role in highlighting the heritage value of individual buildings within Peckham. Eventually their work led to English Heritage (now the part called ‘Historic England’) undertaking an extensive Historical Area Assessment of Central Peckham, 2009 [pdf 7Mb]. In more recent years Peckham Vision has built on this work to raise awareness of how these historic buildings have played, and continue to play, a pivotal role in shaping the town centre. Peckham Vision worked closely with Southwark Council’s Design and Conservation Team to prepare the bid to the Heritage Lottery Fund for the Townscape Heritage Initiative grant. A further stage in the funding application was the adoption in November 2011 of the Rye Lane Peckham Conservation Area Appraisal [pdf 2Mb]. In April 2014 the Conservation Area Management Plan was approved. Here is the map showing the area in the town centre covered by the conservation area. There are adjacent conservation areas, to the east – and to the west. The designation of a conservation area means the local planning authority recognises that the area is one of ‘special architectural or historic interest, the character of which it is desirable to preserve or enhance’. The UK’s planning system requires planning permission to be sought for a range of works to homes and business premises. Where the property is in a conservation area there are additional situations where formal permission has to be granted. – Southwark Council provide information about planning permission for business including shop-fronts and security shutters. – Southwark Council provide information about permissions required by domestic properties in conservation areas. For shop-fronts in older buildings there is widely accepted good-practice about what features of the building should be retained, repaired and restored. But’s it’s not about ‘one-size-fits-all’, it’s about understanding the age and architectural style of each building and using appropriate proportions and materials. 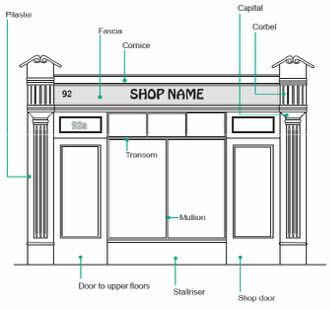 Southwark Council Planning Policy team will be drafting planning guidance about what is regarded as best practice in shop-front design for both contemporary and traditional properties in the spring 2017. It will be widely consulted on amongst both businesses and residents and if approved by councillors will be referred to as a material consideration in determining planning applications. The Peckham Heritage Regeneration Partnership is made up of local people, community organisations, council officers and elected councillors who meet four times a year to contribute to the successful delivery of the Peckham Townscape Heritage Initiative (THI). The Partnership is made up of people who are passionate about Peckham – its past, present and future: there are architects, planners, community activists, historians, conservation specialists, artists and local businesses around the table. – support the implementation of the Rye Lane Peckham Conservation Area. Throughout the THI there will be a series of workshops and presentations on heritage and conservation-related themes. The first Peckham Heritage Talk took place on 14 September 2016 and was attended by thirty local people. Seon Soyemi, Senior Grants Officer from the Heritage Lottery Fund gave a presentation about the national programme of Townscape Heritage Initiatives, and Paul Latham from The Regeneration Practice spoke about the work he’d done to research the condition of buildings in Peckham town centre in order to identify which properties would be eligible for THI funding. The second Peckham Heritage Talk: ‘Breathable buildings’ took place on Tuesday 14 March 2017. Bill Morris, a local architect talked about his approach to working on Petitou café in Choumert Road. Joseph Orsi, who serves on the Society for the Preservation of Ancient Buildings Technical Panel, described the performance of lime renders and mineral paint. Architect Benny O’Looney took the floor on Wednesday 14 June, in the Old Waiting Room, Peckham Rye station for Talk 3. He described several restoration projects that have been undertaken at the station, with a focus on the latest one – the stair project. Benny spoke about the restoration techniques and the conservation ‘philosophy’ used, and highlighted the roles of the different local trades involved including steel fabricators, the makers of the new lath and plaster ceiling/lime-plaster repairs, and the carpenters/main contractor. Peckham Platform host an open exhibition every year. This year, with support from the Peckham THI, they themed their exhibition Peckham’s Heritage – people, culture and place – and ran drop-in workshops through October for people of all ages to make screen-prints of some of Peckham’s most iconic buildings. Our Hut, a London charity which specialises in architecture education, is being funded through the THI to develop teaching resources for primary schools on Peckham’s history and its built environment. They’re also doing a similar project as part of the Brixton THI. Check out the Our Hut website for information on this and other projects they have delivered. Lucy Lavers, Judy Ovens and Suzanna Prizeman make up the Our Hut team. They’ll be working with St James the Great Primary School to develop and pilot the learning resources. The work will take place in the summer term 2017. The work took place in summer term 2017, please see our Primary Schools’ education resource news post, and you can download the Teachers’ Resource Pack, which was created by Our Hut, from ‘Community documents’ in the Community section. Claire Hegarty (10) Chair, and Julie Mallett (8), Peckham THI Project Manager. Eileen Conn (14) – Peckham Vision, Nicholas Gorse – Camberwell College of Arts, Cathy Hirschmann (13) – South London Gallery, Carol Maund – Peckham Platform, Bill Morris (7) – Peckham Society, Rachel Moss – South London Gallery, Nicholas Okwulu (2) – Pempeople, David Reid – Peckham Voluntary Sector Forum, Councillor Cleo Soanes (9) – the elected representative for Peckham ward, Lesley Wertheimer (11) – Northfield House Tenants and Residents Association, Anneke Zeiman (5) – Employment Academy. Sally Alderman, Yewande Fadeyi (15), Dan Harder (3), Barry Jenkins, Derek Kinrade, Emma Lawrence, Michelle Male (12), Benny O’Looney (1), Megan Sclater (6).